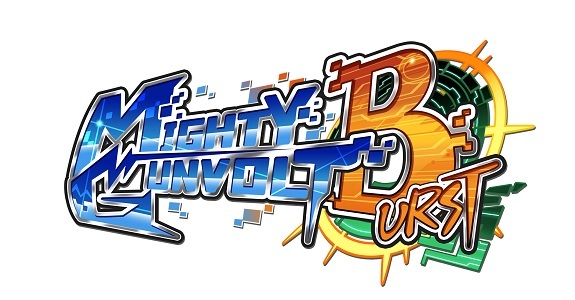 On this page, you will find everything there is to know about Software updates for Mighty Gunvolt Burst on Nintendo Switch (originally released on June 15th worldwide) and Nintendo 3DS (originally released on July 28th in Japan, and July 29th in Europe and North America). 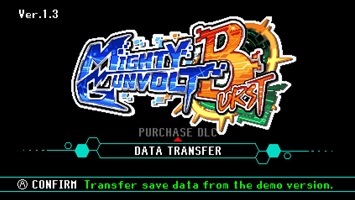 How to download Software updates for Mighty Gunvolt Burst on the Nintendo Switch and the Nintendo 3DS? To check that you have the latest version, simply launch the game: the version number is displayed in the top left corner of the screen. Additional notes: this update adds compatiblity with the new DLC character: Tenzou. New playable character DLC for RAY, Copen, and Kurona has been added. Once the game has been udpated to the most recent version, these DLC options will be listed under the “Purchase DLC” section of the Title Screen. When clearing the Gateway or Cyberspace Coliseum stage without taking damage, the additional bonus points (+3 000) earned for a no damage clear are not awarded. On Joule’s customisation screen, incorrect text in the Help Guide would occasionally display instead of the proper text. (3DS Only) When the thumbnail for “Pixel Sticker No. 176” appears, the wrong image will sometime appear. Other minor bug fixes have also been implemented in order to improve the game performance. Additional notes: this update is required to transfer the data from the demo version, and get Ekoro as a free DLC character. Additional notes: this update adds Ekoro as a DLC character (click here for more details), and most likely fixes various bugs and issues.